The World Economic Forum (WEF) opened in Davos, Switzerland yesterday. Like every year now, KPMG provides a Twitter dashboard on which the most important stats relevant to the congress are displayed. The dashboard answers important questions, like: who are the most important WEF participants on Twitter? Which themes are trending? What does the Twitter activity of followers look like, and where do they actually come from? Every year the World Economic Forum (WEF) is organised in Davos, Switzerland, at which the world’s top businesses, international politicians and academics come together. At the WEF the participants discuss the most important economic, social and demographic trends and issues of our times. This year a total of 16 consultancy firms will take part in the world forum, including KPMG. The accounting and consultancy firm is part of a select group of 100 firms worldwide* termed ‘Strategic Partner’ of the WEF. These Partners are, according to the WEF, firms that are leading in their field and offer solutions for worldwide social and economic problems. 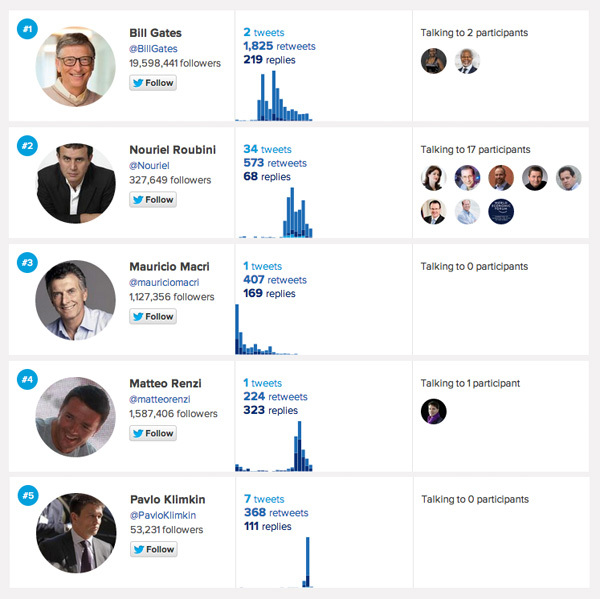 Besides its role as Strategic Partner, KPMG, just as last year, has another important role at the WEF: the Big Four firm provides for WEFLive.com, a Twitter tracker which maps the activities of tens of thousands of followers of the event. KPMG, among other things, tracks the tweets of the 3,000 participants, retweets and/or replies to these tweets related to the WEF. The results are displayed on the dashboard display which shows that on the first formal day of the WEF, January 20, 38.793 tweets were sent. Yesterday, January 21st, this climbed to 41.702 tweets. The rubric ‘stats’ zooms into a breakdown of the total number of tweets, retweets and replies created during a day. Next to which the statistics are analysed for the national background of participants and followers so that the most avid countries following the WEF can be displayed. The sentiment – positive, neutral or negative – of the tweets is measure, as well as a gender breakdown of the tweets mapped. From the statistics for yesterday, the most avid Twitterers came from the US, UK, Switzerland, France and India. In terms of the gender of the tweeter, 67% were male and 33% female. * Other consulting firms represented include the Strategic Parners: A.T. Kearney, Bain & Company, Boston Consulting Group, McKinsey & Company, Strategy&, Deloitte, PwC, EY, Accenture, Mercer en Oliver Wyman.